I can see and understand your validation that a stored procedure also produces an “SP:CacheMiss” event and then a “SP:CacheHit” event however, can you explain why this course of events occurs? So to clarify, why does a miss occur prior to a hit even when the plan is cached? Count me in with the people who give, and believe, the ‘story’ that ‘stored procedures get and reuse execution plans, but ad hoc queries do not’ and who ‘say as much online and in the real world’. Of course, if you reckon that a parameterized query is ‘ad hoc’ then that certainly complicates the debate. The way I’ve always looked at it, an Ad-Hoc query ceases to be an ad-hoc query once it has become a parameterized query. Once it has become a parameterized query, I’ve always found them to work as if they were stored procedures: to all intents and purposes, it is, surely, a temporary stored procedure. This discussion hinges on your understanding of the term ‘Ad-Hoc query’, of course, but I’m not sure I accept that ‘There are ad hoc queries and there are ad hoc queries’. I therefore reckon it is a bit confusing to use the word ‘myth’ when referring to the fact that ad-hoc queries cannot re-use query plans if a parameter is changed. Heaven knows, the ORM brigade find that the whole subject of plan-reuse makes their heads swim, and I suggest that we have to keep the message clear and simple, even if it makes for a fascinating discussions for anyone doing database development work. All true Phil. I guess I’ve always thought of ad hoc as built queries, either on the client or on the server. Seperated from pre-built (not pre-compiled of course) queries which are procedures, etc. From both sides, client & server, they can be built in a silly fashion that completely precludes plan reuse or they can be built properly so that they take advantage of code reuse. I guess it is primarily a definition of terms situation. Just to check, I went and looked at several sources… You’re right & I’m wrong on this one Phil. Most people are very precise in differentiating between ad hoc queries and prepared queries (Kalen Delaney’s term). Following on what Phil said, I typically refer to the prepared queries as “Dynamic SQL”… the other types of query are “Ad Hoc SQL” and “Stored Procedures”. It helps explain things. They also show up differently when you’re looking at the plan cache since ad hoc queries show up as ‘ad hoc’… I forget what the others appear as, but they’re different as well. John, sorry I left you hanging there. My understanding of why you see a miss is that the batch itself goes through a cache check and finds a miss, but the procedure finds a hit. If you ran the same query again, without changing the parameter value, I think you’d see two hits, but I’d have to test that again to be sure. 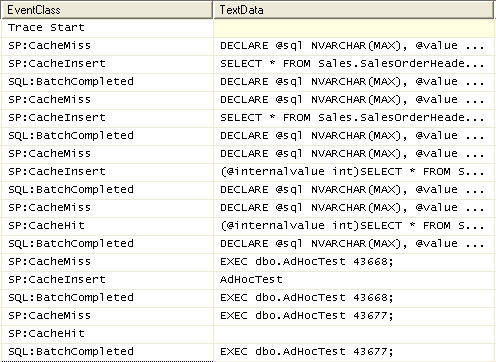 Even the first example of ad-hoc query can have it’s plan reused if SQL decides itself to parameterise it. Either because it’s a very simple query and qualifies for auto-parameterisation or because Force Parameterisation is set on. Yes, absolutely. I left it out of the discussion though since it’s pretty difficult to count on simple/forced parameterization for most queries. The original ad hoc query didn’t result in simple parameterization due to the JOIN. Take away the JOIN and you do get a parameterized query. Yes, that’ll work, but if you want to see the events as they occur rather than try to track down if they’ve occurred, trace events are the way to go. But why the Cache miss followed by Cache hit rather than Cache hit for each subsequent call ? Because the batch as well as the procedure get a cache check. When you change the parameter value, it’s a new batch and gets a miss.